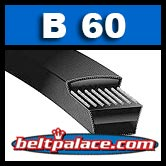 Bando B60 Classical V-BELTS: B Section 21/32" Wide. 63" Length OC. Home > Heavy Duty V Belts > Moulded Notch V-Belts. AX, BX, CX, 3VX and 5VX Sections. > BX Series. 21/32" WIDE COGGED V-BELTS (TRI-POWER/KING COG/PRIME MOVER) > BX62 Power King V Belt. COGGED BX62 Industrial V-Belt. > B62 V-BELT > B61 V-BELTS: B Section > B60 Classical V-BELTS: B Section. 63" Length OC. B60 Classical V-BELTS: B Section. 63" Length OC. B59 Classical V Belt. 62 inches O.C. 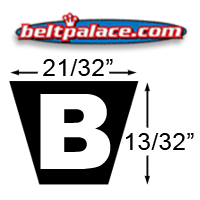 BANDO B61 Classical V-BELTS: B Section. 64" Length OC.